A cute decoration that makes naptime easier. 1. Gather your material. You will need white felt, a scrap of pink Fun Foam, wiggly eyes, a Styrofoam ball, white glue and/or hot glue, a pink marker, a white pipe cleaner, two metal wires (for floral arrangements), and a wooden door sign. 2. 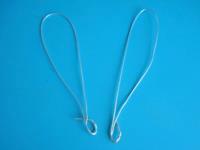 Bend the two metal wires to form bunny ear shapes. 3. 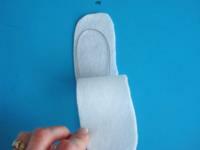 Cut the white felt in half and fold each piece in two as shown. 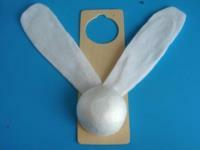 Deposit the metal ears on the white felt and cut around them so you have four bunny ears in all. Make sure the felt bunny ears are a little bit bigger than the metal ears. 4. 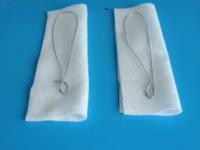 Glue each metal ear between two felt ears and seal the contour of the ears with glue. 5. 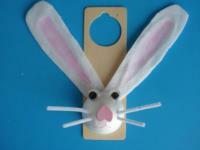 Glue the two felt ears diagonally on the wooden door sign. Cut the Styrofoam ball in two and stick half a Styrofoam ball on top of the base of the ears as shown. 6. 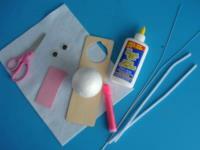 Using scissors, make two slits at the top of the Styrofoam ball. 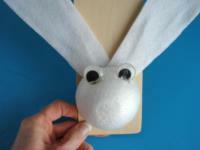 Fill the slits with glue and insert the wiggly eyes. 7. Cut a small heart shape out of the pink Fun Foam and stick it upside down in the centre of the Styrofoam ball to represent a bunny nose. 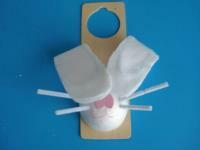 Cut the pipe cleaner into four pieces and insert two pieces on each side of the bunny nose (moustaches). Use the pink marker to draw a mouth and gently color the inside of both bunny ears. 8. 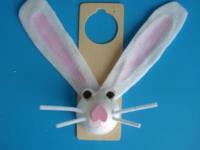 At naptime, show children how they can fold the bunny ears over its eyes. When the ears are in this position, it is time for children to sleep. When naptime is over, unfold the bunny ears. If the bunny ears are pointing straight up when children wake up, they will know that they can get up...naptime is over.